YANGON, Myanmar — In the latest show of popular opposition to China’s proposed Myitsone dam in northern Myanmar, prominent environmentalists, writers and civil society leaders formed a national committee on Monday to oppose the project and warned the government of more resistance if it were revived. While China steps up pressure on the government to resume work on the dam, the meeting in Yangon was the first time that about 200 people from across the country came to together to show solidarity with Kachin State residents fighting the project. “I don’t want [the government] to make a decision [on Myitsone] easily,” said U Tun Lwin, a well-known meteorologist and founder of Myanmar Climate Change Watch. “If they make the wrong decision, [the government] will face severe problems both politically and environmentally,” he said. About 3.2 km south of where the confluence of the May Kha and Mali Kha give rise to the Irrawaddy River, the 6,000 MW dam is expected to cost $3.6 billion, ranking among the largest hydropower projects in the region. Work started in 2009, when China’s State Power Investment Corporation was known as the China Power Investment Corporation. Environmentalists warn the dam site has some of the highest biodiversity in the world and that the project would both destroy the natural beauty of the Irrawaddy River and disrupt water flow. They say it could potentially flood an area the size of Singapore, destroying livelihoods and displacing more than 10,000 people. In September 2011, then-President U Thein Sein suspended the project due to widespread concerns about its environmental and social impacts. After taking power in early 2016, the National League for Democracy (NLD) set up a 20-member commission to review the project and its likely impacts on the environment and local communities. The commission has produced two reports, but the government has yet to release either. Beijing’s recent efforts to restart work on the dam have reanimated resistance to the project, especially after Chinese Ambassador Hong Liang claimed that the Kachin people were not opposed to its resumption after a visit to Kachin State in December. The envoy’s claim sparked protests in Yangon, Mandalay, Myitkyina and Pathein urging the government to end the project for good. 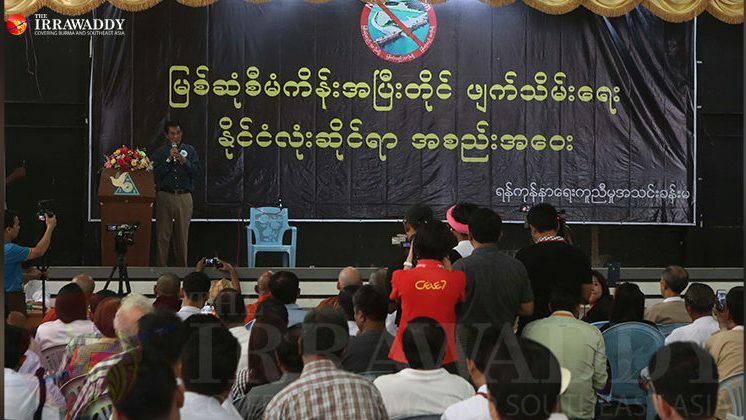 At Monday’s meeting in Yangon, Ko Tar, a popular writer, told attendees that the dam would not benefits locals with jobs or electricity and would not contribute to the country’s broader development either. Under the terms of the initial agreement, the dam would send 90 percent of its electricity to southern China’s Yunnan Province. Last month, State Counselor Daw Aung San Suu Kyi called on the public to consider the dam from “a wider perspective” and said that projects approved by previous administrations should not be cancelled just because they did not comply with the current administration’s policies. The comments raised concerns that her government would do Beijing’s bidding, in particular when it came to the Myitsone dam. “I cast a vote for the current government because I believed that it wouldn’t behave like the previous [ones].” said Ko Tar. “We all want the government not to make the same mistakes again. We want a government that will correct past mistakes,” he added. While campaigning for the 2015 general election, Daw Aung San Suu Kyi promised to release the contract the country’s military junta signed for the Myitsone project, but it has yet to do so. “There are a lot of approved project that had to be stopped for the long-term benefit of the nation,” said U Tun Lwin. He noted recently elected Malaysian Prime Minister Mahathir Mohamad’s decision to cancel Chinese-backed projects approved by his predecessor, Najib Razak, over concerns that they would not benefit the country and saddle it with too much debt. Daw Aung San Suu Kyi has said that her government would make a final call on the dam based on political, economic and environmental factors and provide a detailed explanation of its decision. In late January, U Thaung Tun, the investment and foreign economic relations minister, said the government and commission were having very serious discussions and considering all possibilities, including downsizing the dam, relocating it or developing other projects instead. Juu, a prominent female writer, told Monday’s attendees that she did not want any dam on the Irrawaddy River, the country’s lifeline and the next generation’s inheritance. “I understand that our leaders are under pressure from China. But I am just a citizen, so I will think like a normal citizen. I will keep opposing the project,” she said. In Waimaw, one of the townships downstream of the dam and about 19 km from Myitkyina, the capital of Kachin State, more than 4,000 residents worried the dam could flood their homes if ever burst are planning to stage a protest against the project next week. During Monday’s meeting, the newly formed committee issued a brief manifesto urging the government to protect the next generation, avoid any deals that jeopardized the country’s independence, and cancel the project. “If they don’t keep their promise, the future will be bleak,” he said.